I love to crochet. More creative, more fun! Y'all. Crocheting is one of the things that actually keep me somewhat busy. I'm way too excited about this project. I don't know but every time I finished a new project, the feeling can be magical or I guess I just love crochets. This weekend I was able to make a Mandela crochet bookmark. Bookmark is so perfect for a book hoarder. A unique and classy bookmark. Isn't cute? They're easy. I love the design and colors. I hope this bookmark can add enjoyment for your reading session. So let's start and make your own. Waking up everyday is a gift. We are blessed to have and enjoy this splendid world. Appreciating every single things is dominant and I always see things beautiful in its own way. Sometimes it's nice to be like a butterfly. Enchanting, vibrant and free. God gives us enough strength to do what He wants us to do. Blossom like a butterfly. I decided to make a butterfly crochet. I made it last night. And it is simple yet magical crochet. I made a picture and word tutorial. Hello hookers. I'm back on track. How's your November so far? Mine is doing great. After a long months of sorrow, aches and drama, well I know I'm back in shape and I'm happy and thankful. God made it this way for me to realize that I have a good and blessed life after all. Anyhow, I missed crocheting. 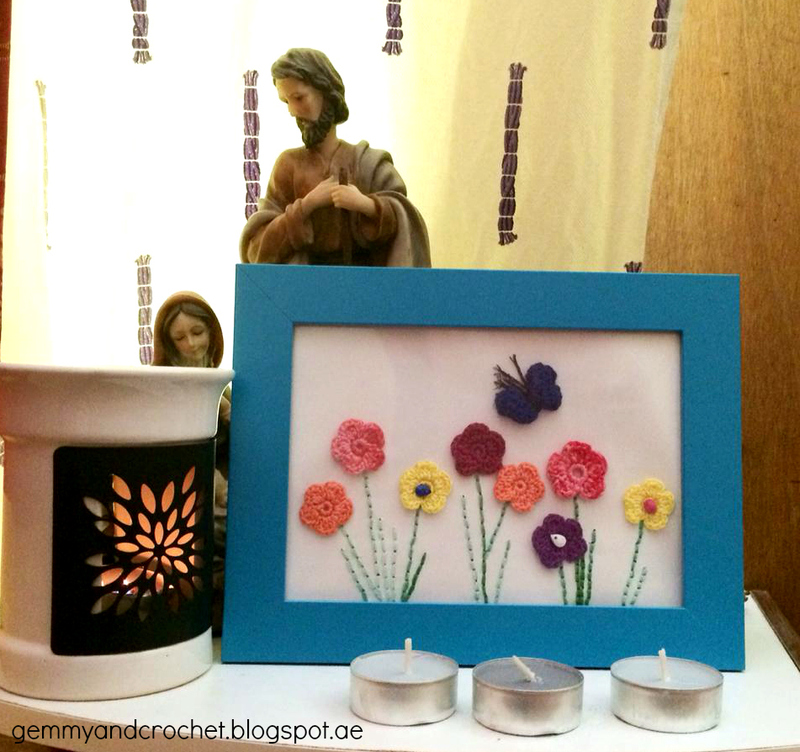 Glad to share a simple and easy crochet project. As always, it is for styling and fashion. Rock on with this fabulous crochet chain bracelet. Who doesn't love sale? I guess everyone does. My love for crochet knows no time. It helps me in my heart's healing process. And as my heart wants peace, I made something cute and it made my heart smiled. Last night, I went out for walking and found one crafty shop and bought new yarns. 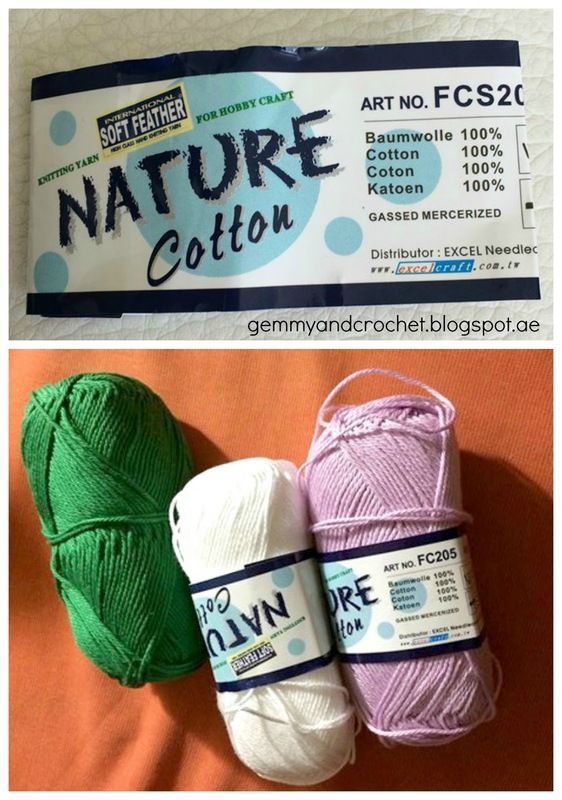 These yarns are actually knitting yarns as per label. The texture is so good and thick. I also got it for a good deal. It is made in Taiwan. 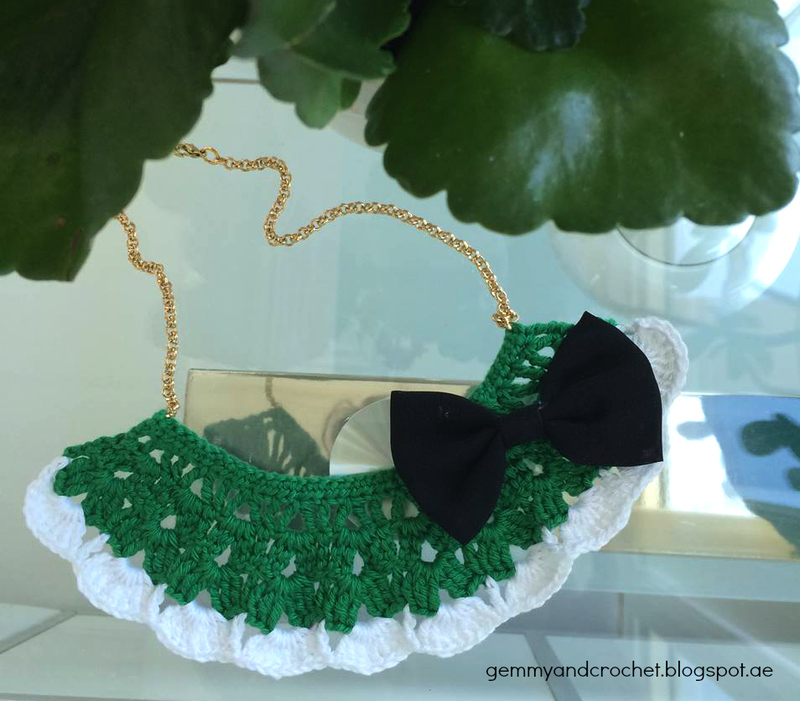 Using color green and white yarns and my favorite 1.5mm steel hook, I made a simple bib necklace. Easy to make and follow. I prepared a photo tutorial of it. My necklace has a 7 inches length and 2 inches for the width. Chain 42 stitches (40 + 2 = 42). Half double crochet in 3rd chain from the hook. Half double crochet for the next stitches. Chain 3. October is here. How time flies. 2014 is starting to say goodbye. Goodbye is never easy. In every goodbye, you always say hello to a brighter side, new hope, new life and a new year. Goodbye will always leave us a lesson that will make us to be braver and stronger . I wanna be brave to face goodbye to the bad things in my life and will give me a lesson that I will never forget. Trusting stranger and opening your life to them is not easy...but because of love you will learn to embrace it. But love will never be enough to trust anyone. You have to invest time. They will hurt you the least you expect it. They will trade you to somebody and dump you like nothing. Love is the most wonderful moment that will come your way and at the same time will tear you up pieces by pieces. In order to be whole and happy again you have to say goodbye to all the people who've hurt and leave you hanging. My heart is crying and bleeding but life must go on. Have faith in God. They maybe happy to where they are now but life is never always on top. I wanna be as colorful and cheerful like a flower that is blooming so perfectly beautiful. I wanna be back to who I really am. A cheerful and at peace person. Yes, they've hurt me but if that is the only way for them to be happy, let them be. I am saying goodbye and erasing them in my life..
All posts are written by Gem Mejia. Simple theme. Theme images by GelatoPlus. Powered by Blogger.